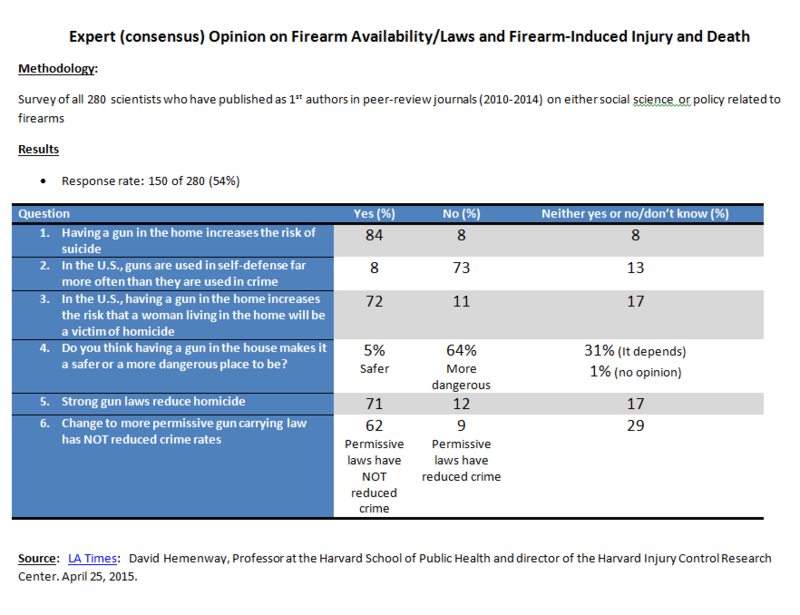 Harvard’s David Hemenway, arguably the nation’s foremost expert on gun violence had a problem. The press often asked him for his opinion on gun violence issues and after he gave it he found they sought an opposite opinion. He felt that his was the majority opinion, but it was not treated that way. He was told that journalists would only treat his studies as conclusive when the literature showed a preponderance of opinion on one side. So he set out to survey his colleagues to see whether he could show that excess guns and lax laws were behind our marked excess in gun violence compared to other industrialized countries. This is what he found. ” I decided to determine objectively, through polling, whether there was scientific consensus on firearms. What I found won’t please the National Rifle Assn. Of course it’s possible to find researchers who side with the NRA in believing that guns make our society safer, rather than more dangerous. As I’ve shown, however, they’re in the minority. David Hemenway is a professor at the Harvard School of Public Health and director of the Harvard Injury Control Research Center.